Whenever I admire a piece of art, I can’t help but wonder how it was done. How did the artist get that amazing texture? What colors did she or he mix? What type of brush or implement was used? In other words, how did they do that?? 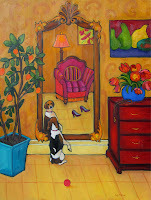 Rena Vandewater’s charming paintings are full of color and energy. She combines several techniques: pointillism, patterning and what she calls “scruffling,” which is her way of moving her brush very quickly on the canvas while mixing color. All three combine to create vibrant scenes. Travels often inspire her paintings. 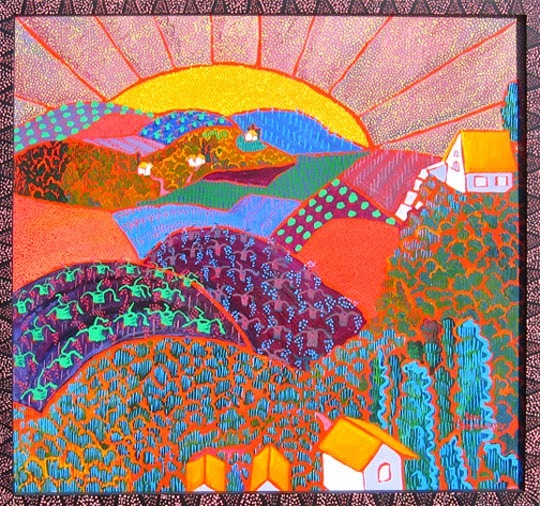 “Yellow Sun” is a scene from vineyards Rena saw while visiting France. 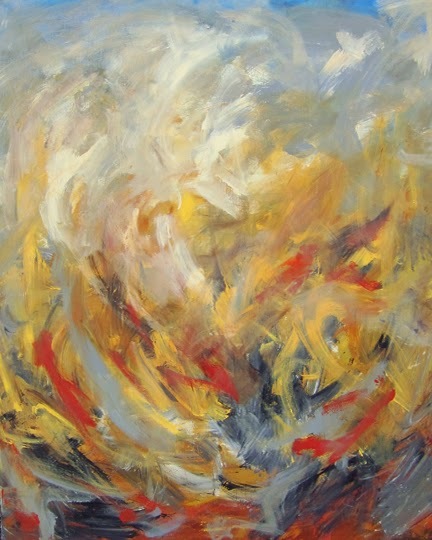 “I want the viewer to see a real reference, yet enjoy the wonder of the painting,” she says. The red ground behind the vineyard patterns, as well as the red outline of the small buildings and the sun give this painting so much energy! The shapes remind me of quilting. Rena has worked hard to create and maintain her unique style. Initially, she was self-taught; then she went on and obtained an MFA degree. “Although I’ve studied and learned classical painting, I prefer the naïve, primitive style,” she says. 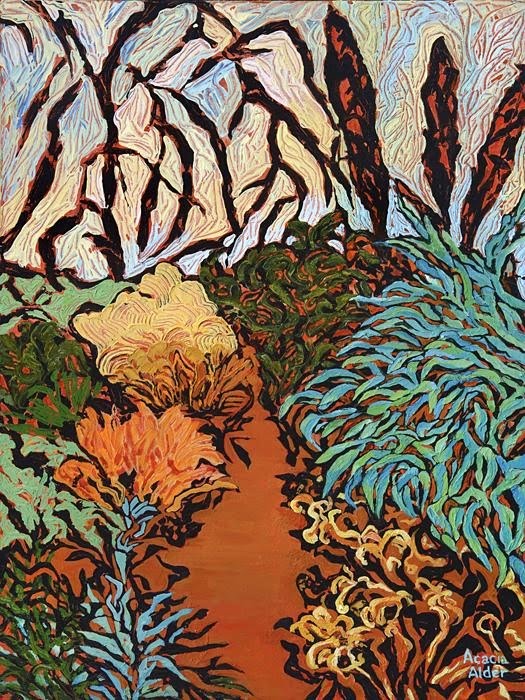 “Dingo Dogs” is a good example of Rena’s unique take on a landscape. 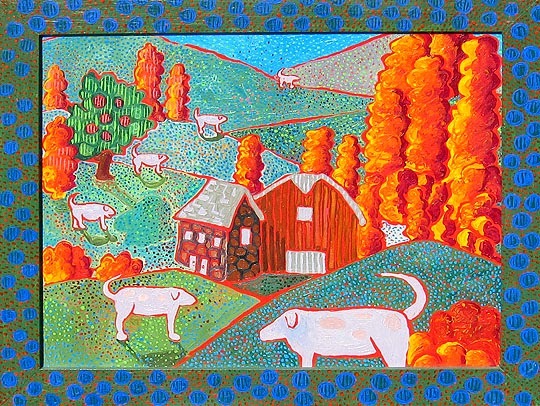 Here, she employs all of her special techniques: the red outlines, the scruffling for the trees, the patterns in the houses, the flat paint for the dogs, and the wonderful pointillist dots for the land. 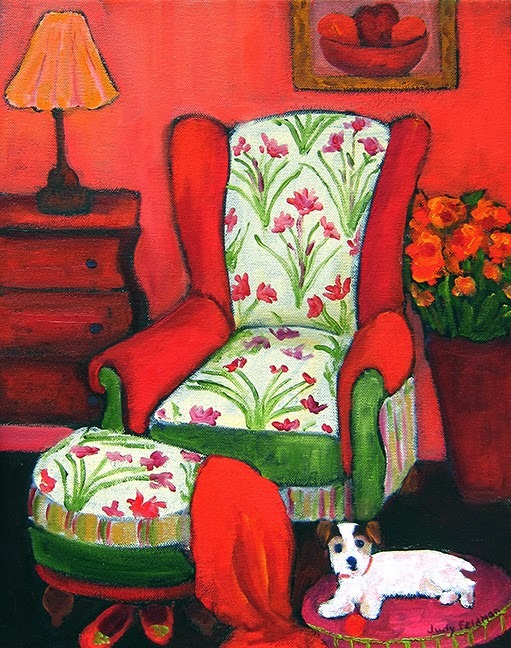 Her use of the complementary green and red in the dots really makes the painting pop. To top things off, Rena encloses the painting in a patterned frame. It’s busy, but it works! Acacia Alder loves to hike in the trails around her Tuscon home. 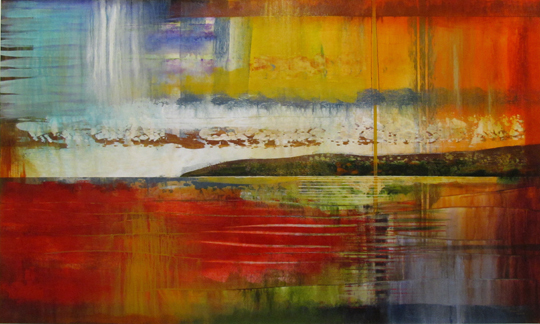 She’s inspired by the landscapes she sees, and wants to depict the dynamic energy that exists there. 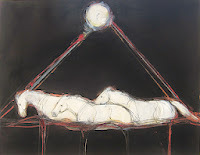 Acacia conveys all this through a technique she employs to give her paintings a sculptural, three dimensional look. I asked her to explain. Acacia uses many different implements, including palette knives, brushes, small spatulas and even hair combs for texture. She says that her technique enables her to impart tonal changes, because the gel textures can more easily highlight the light and the shadows. 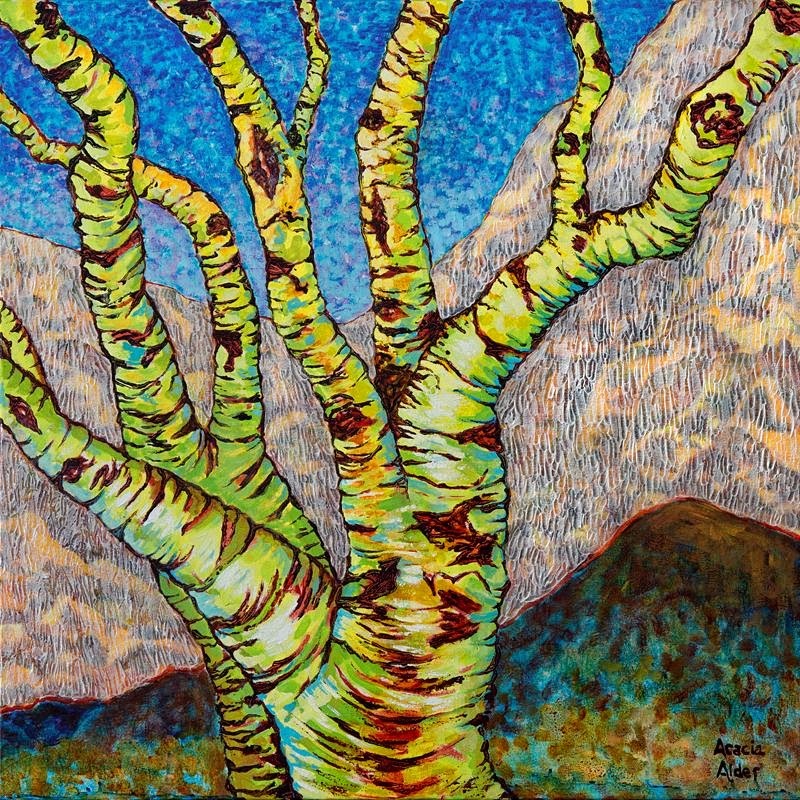 You can see the sculptural quality of the beautiful tree in her painting entitled “Elan: Palo Verde Musings.” Her excellent use of light and shadow, along with a dark outline, makes the tree emerge from the abstract shapes of the landscape behind it. 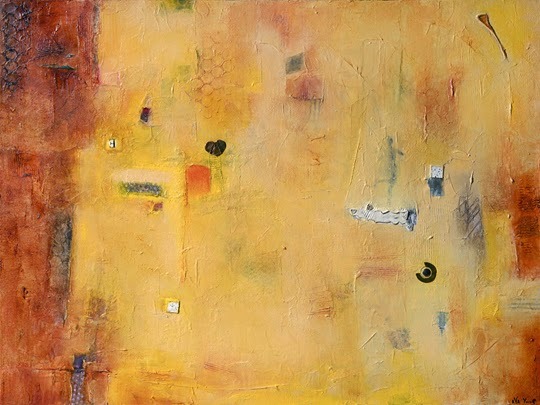 “Desert Garden” is one of my favorite paintings by Acacia. The many textural shapes and wonderful color palette create energy, and the smooth, burnt orange path is a great, restful contrast. I really like the foliage shadows she’s created on the path. Then, Tracy paints an abstract design within the black lines, while she finds a shape to help guide her to her final image. “It’s like looking at clouds and seeing distinct shapes,” she says. Certain shapes evoke certain animals to her. She sees bears in circular shapes; cows in more boxy shapes and buffalo in sharp angles. 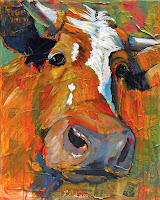 Tracy’s fine art background and familiarity with animals enables her to depict their structure and muscles even in her unconventional style. She purposely doesn’t show the entire animal, since she wants the viewers to finish the picture in their heads. 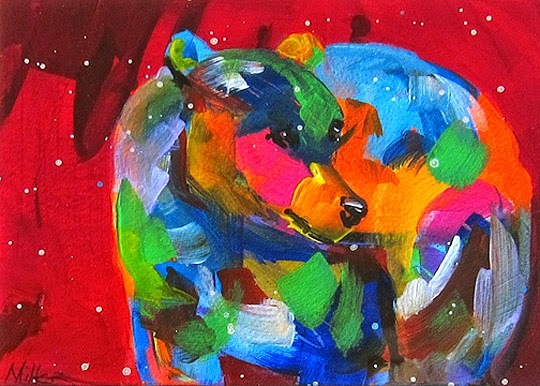 When you look at two of her paintings, entitled “Roughneck” and “Bear,” you can get an idea of how she works. 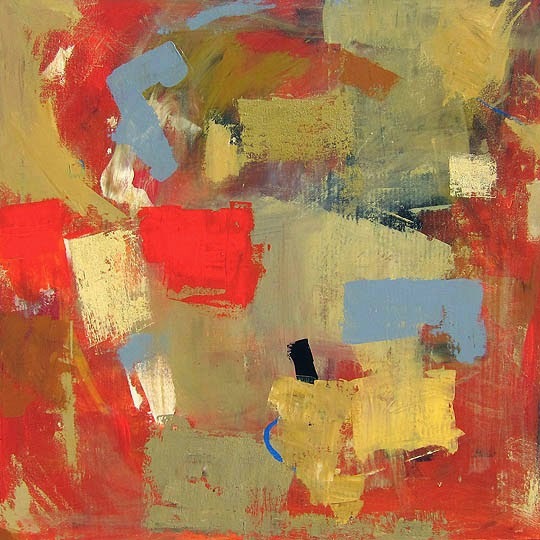 Each of these artists has refined her process over time, and is now completely comfortable with it. What’s interesting to me is how personal these approaches are, and that’s why their work is so unique. Even if we understand the process, we can never paint the same way. Who wants to, anyway? 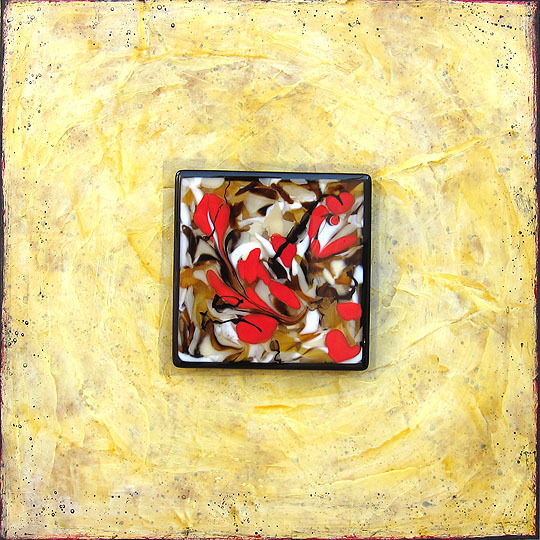 View more art by Rena Vandewater, Acacia Alder and Tracy Miller at Wilde Meyer Gallery. Just Say “No” to Canvas! Since I’m a fairly traditional artist, I paint on canvas or, sometimes, wood panel. But, I’ve discovered, after talking to other artists at the gallery, that it can be fun to paint on other surfaces. That’s not such a new idea. Aside from really early paintings such as petroglyphs, traditional art was made on wood panels, before canvas came into use in the early 1400s. According to Wikipedia, panel painting remained more common until the 16th century in Italy and the 17th century in Northern Europe. But, walls and wood panels are pretty ordinary surfaces. 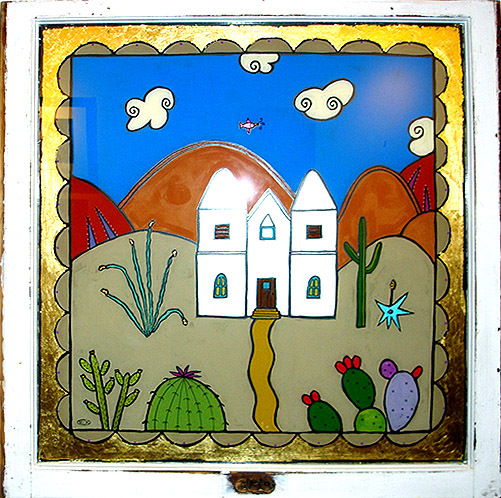 How about vintage windows; mixed media with glass and paint; sheet metal and ceramics? That’s what I saw looking at the Wilde Meyer website, so I decided to give those artists a call. Melinda enjoys the process of painting on smooth glass. 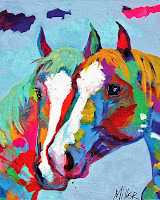 She uses acrylic paints, often layering to get the desired effect. However, painting on glass can be challenging. Melinda says that it’s a reverse process, so she has to paint all the details first, and then the large spaces afterwards. 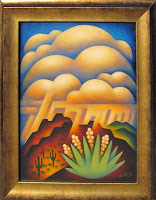 If you look at “Casa Blanca,” you can see that the house, cacti, mountains and clouds are all outlined in black, and the big shapes are mostly flat paint. Sometimes Melinda leaves a little space between the outline and bigger shape to let a little of the transparent glass show through. She’s also designed a frame of gold leaf on the glass, which fits inside the window pane. “El Parajo” also has its own painted border. This painting, too, has a folk art aspect to it. 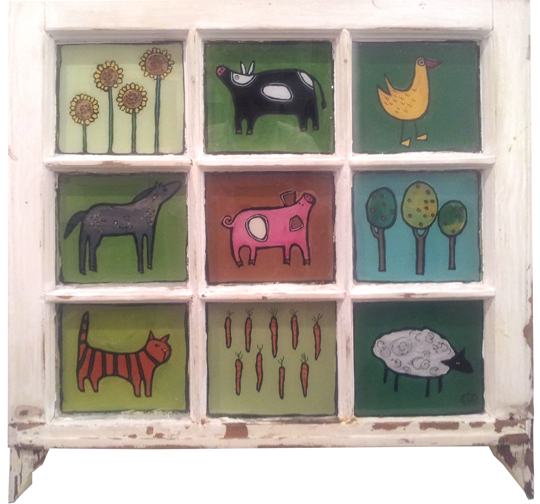 Melinda told me that in Europe, painting on glass was generally folk art, so she also chooses themes in this tradition. Aside from loving the process of painting on glass, Melinda says that this support medium gives her images a very luminous effect. And, the vintage windows are a great conversation piece: just look at “The Farm.” A great way to recycle! Josiane Childers enjoys painting on smooth surfaces, too. 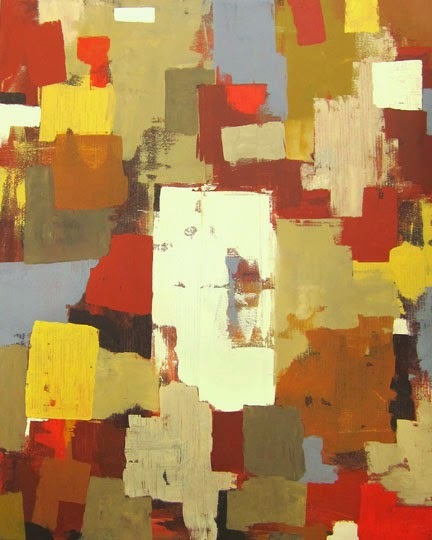 She’s chosen thin sheets of steel, as well as plexiglass to support her beautiful abstract paintings. She works with her husband Justin, who prepares the surfaces, grinding parts of the steel and plexiglass to create texture. He also creates the frames on which the steel pieces are attached. When she paints on plexiglass, Josiane works on the frosted side, but presents the painting on the smooth side. 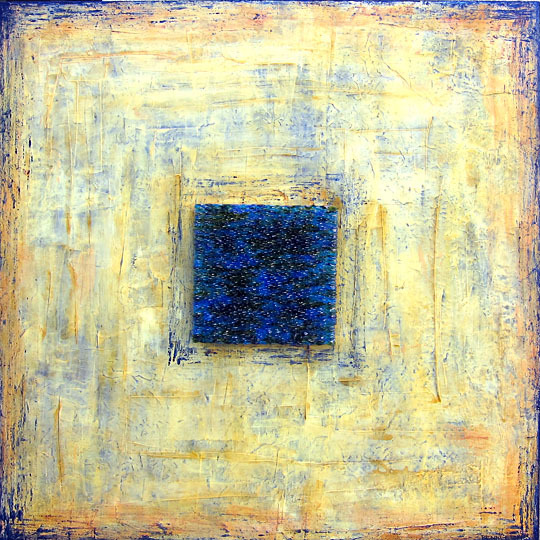 She encounters the same challenges as Melinda, since she, too, is painting in reverse. Thin steel gives Josiane another option to present her art. 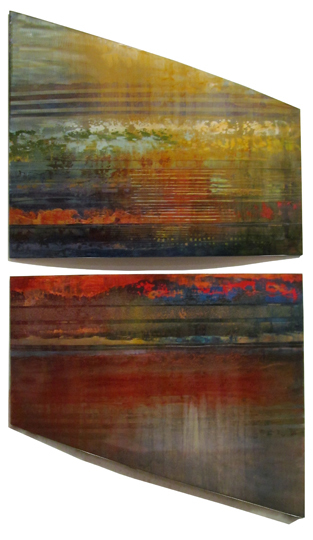 The two pieces of her vertical diptych entitled “Invoke” are uniquely shaped and curved, welded to a flat frame. Again, the textures on the steel show through, offering spontaneous shapes, grabbing color in a different way than the smoother areas. 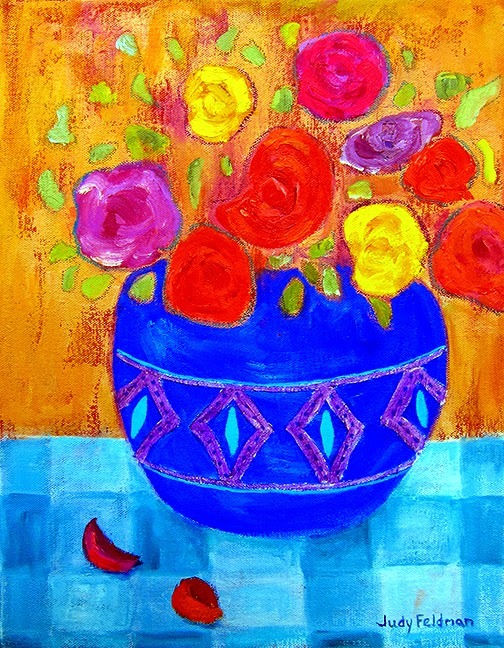 Josiane paints intuitively, using bright colors, and these surfaces seem to work so well for her. She hasn’t abandoned canvas, but when she does paint on that surface, she textures it as well, using molding paste and then, thick paint. 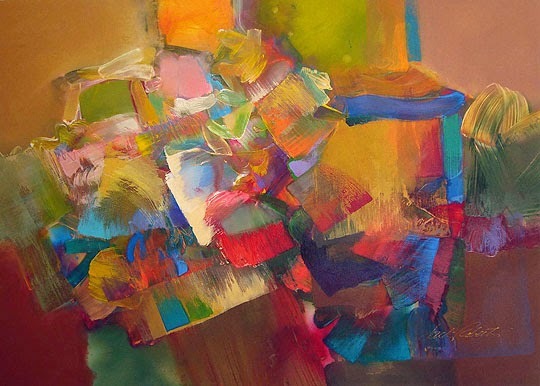 “Materialize” is an example of her mixed media technique. Kathryn Blackmun was a graphic designer and illustrator living in Los Angeles. 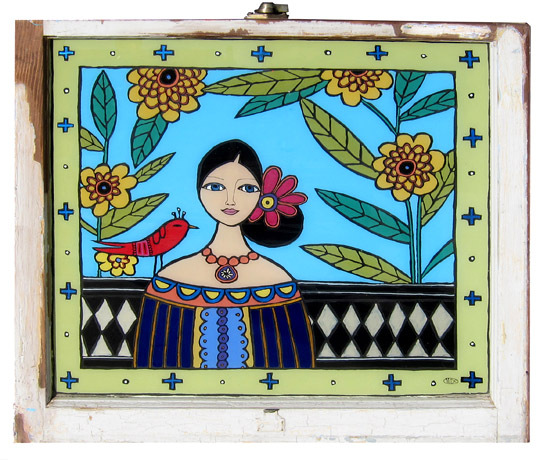 When she moved to Santa Fe, she decided to study ceramics. 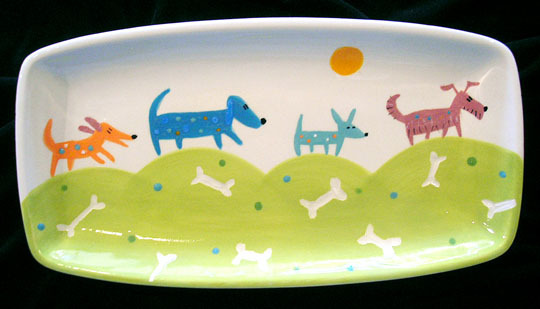 Now, her whimsical images of dogs, cats, cowboys and cacti are painted on greenware plates. This labor-intensive process ends with a coat of clear glaze, and another firing and cooling. To look at a happy piece such as “Dog Trek,” you’ve never know it was so time-consuming! 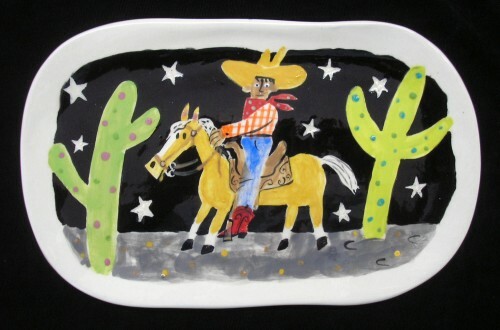 “Cowboy Palomino” is a good example of Kathryn’s folk art style, which is well-suited to this type of ceramics. After I finished interviewing these artists, I went to a local thrift shop. Poking around, I found three wood frames with glass inserts. Guess what I’m going to try? But, I’m not abandoning canvas. I have too much inventory! Summertime is a favorite season to get out of town (especially if you’re in Phoenix) and enjoy the scenery elsewhere. But, sometimes that’s not possible. 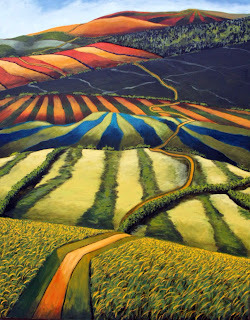 So, what better way to take a vicarious trip than enjoying a beautiful landscape painting! 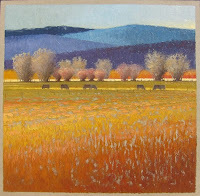 There are several wonderful landscape painters at Wilde Meyer. Most are avid outdoors people who love to explore their surroundings in Colorado and New Mexico. Although they all do some studies en plein air, they prefer to take photos and communicate their experiences with larger studio paintings. Michael Baum said that he and his wife often take road trips in the late afternoon during the summer, “putting on a couple hundred miles, when the light is just right.” She drives, and he takes photos. 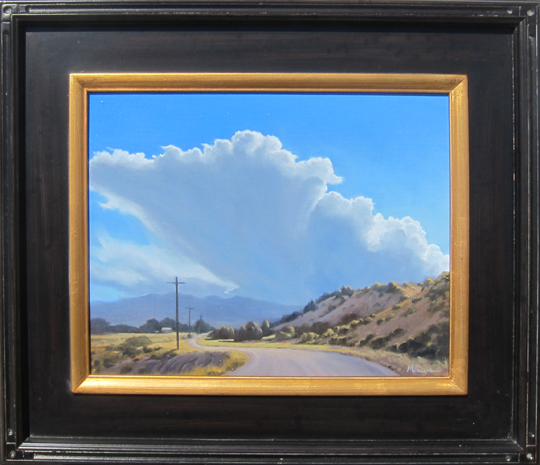 His painting entitled “Clouds Building” is from one of these trips. I think we can feel the special moment of early morning when we look at “Sunrise on the Bluffs.” And, looking at the cool blues and greens in the beautiful water reflections of “Summer Oasis” makes me forget the summer heat outside! I admire the way Michael has made his mountains recede with muted cool tones, allowing the trees and water to catch the light and sparkle. 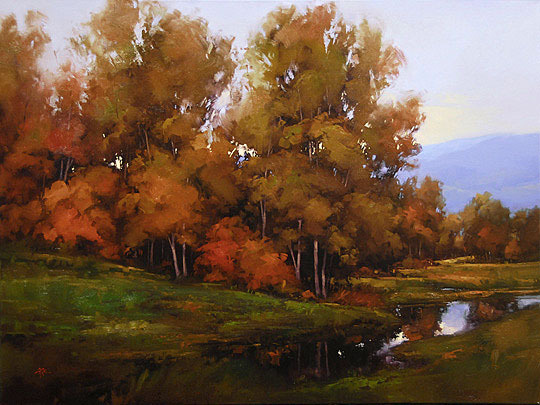 His painting entitled “In Harmony” reflects Gregory’s process, and his feelings towards that place along a creek. His beautiful brush strokes and fiery hues tell us that this is a lovely autumn day. 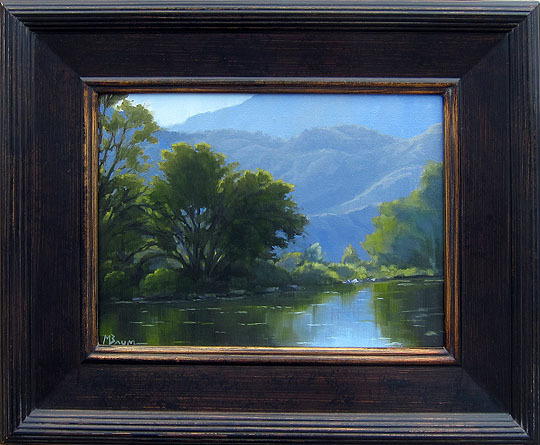 The reflection of the sky and trees in the water brings the viewer into the painting, and invites us to stay a while. Gregory also uses memory to call upon scenes from his youth in the Snake River Valley of Idaho, where he spent his teenage years. “I don’t remember caring so much about the landscape when I was there, but now I’m mining it all up,” he says. 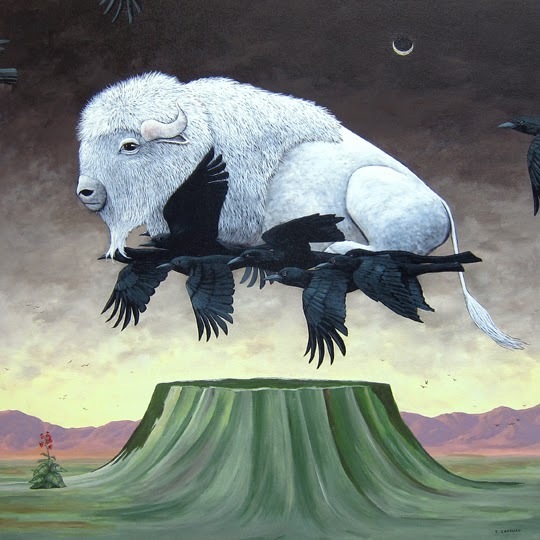 Stephen Morath takes a different approach to his paintings. He uses references to places he’s been, but it’s more of a distillation of various landscapes. And, there’s usually a story to tell. 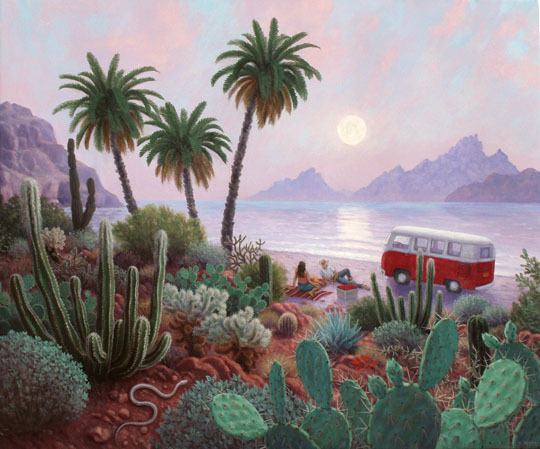 For example, “Another Baja Moonrise” shows an unusual image of a desert landscape looking across the Sea of Cortez. But the tall palm trees and the VW bus imply there’s a bigger tale here. According to Stephen, the couple represents Adam and Eve, “totally alone in an exotic landscape.” I guess the snake is another clue. The “hippie vehicle” is something Stephen always wanted! Since he enjoys painting with cool colors, Stephen likes to portray a scene at the end of the day, or, as with “Morning Moon,” at first sunrise. He commented that his work has an air of “magical realism,” meaning that his attention to details is somewhat unnatural, and his landscapes definitely have a romanticized perspective. The red truck is a wonderful accent against the cool morning desert. Sometimes, Stephen lets his imagination take over the painting. 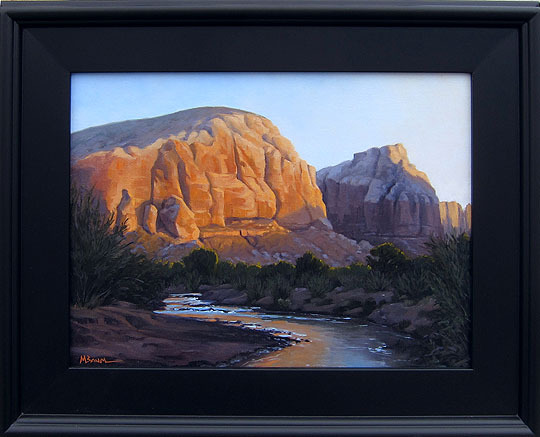 In his work entitled “Mescalito,” we see what looks like a New Mexican landscape, but there are many characters in this story. 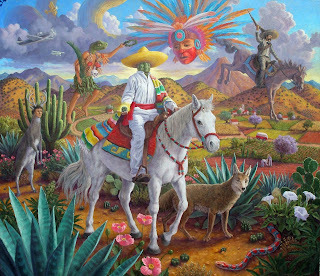 I was first drawn to the horseman in the foreground with the cactus face, but then my eyes went everywhere, looking at the images and trying to decipher their meanings. I’ll leave you with that comment. To see more, and come to your own conclusions, it would be best to see the painting at Wilde Meyer! 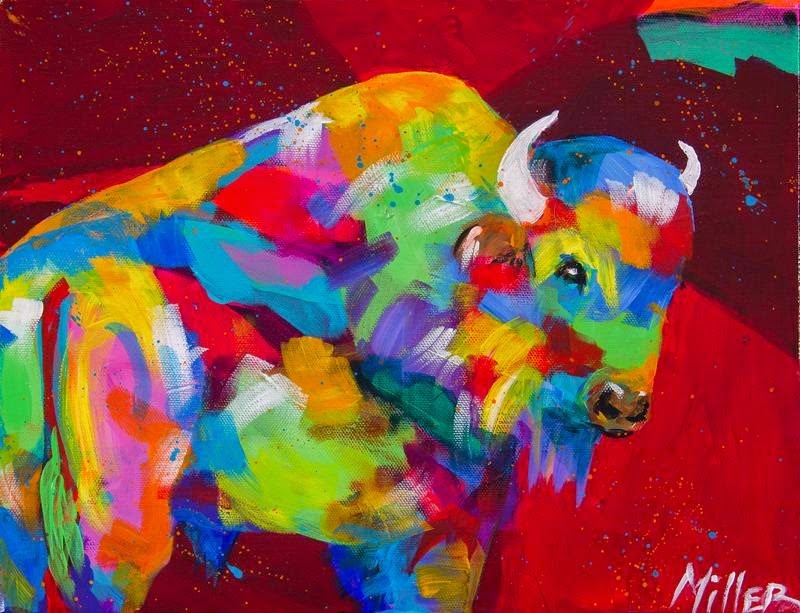 Wilde Meyer Gallery represents so many fine artists; we thought we should give you a sampling of some of their recent achievements and honors. 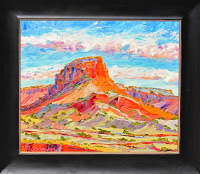 Timothy Chapman, Michelle Chrisman and Jeff Cochran are all included in a new hardcover book Contemporary Art of the Southwest. This is a beautiful high gloss book representing the best artists of the American Southwest. 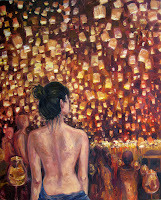 Author is E. Ashley Rooney with forward by Chief curator of Contemporary Art for the Tucson Museum of Art – Julie Sasse. Timothy Chapman is also exhibiting his work in the US Embassy in Nairobi Kenya. 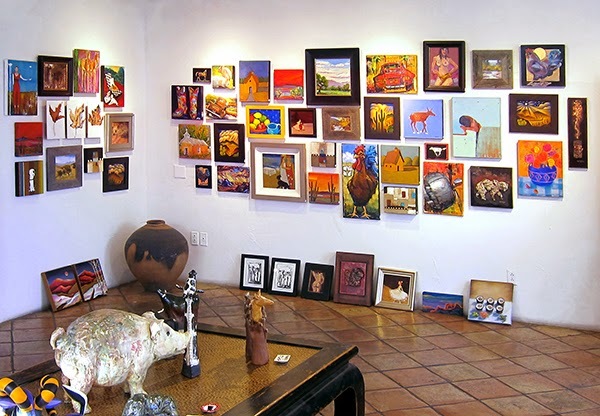 Trendy Santa Barbara Magazine chose to feature Karen Bezuidenhout's paintings in a home located at fabulous Rincon Beach. 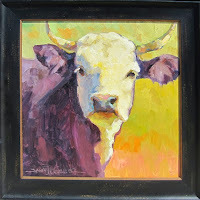 Karen has also completed commissions going to Johannesburg, South Africa, and Noosa Australia. Bill Colt and Andrea Peterson’s paintings were real hits in their Scottsdale restaurant, so Del Frisco’s is now including them all over the United States. 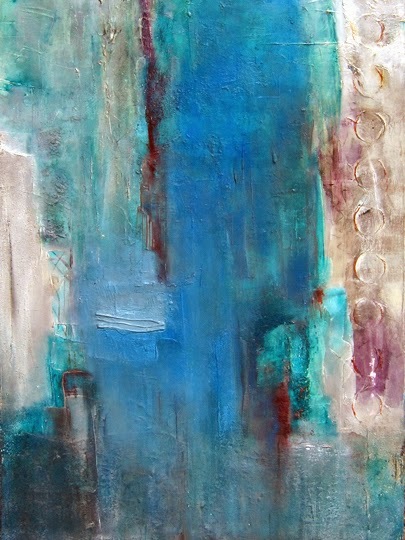 Debora Stewart is finishing her book Abstract Painting: Expressions in Mixed Media. North Light Books will release it April 2015. 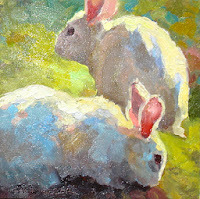 In the “how to” book Debra shares her secrets for creating pastels and acrylic paintings. One of her recent pastels is on exhibit in Boston at the acclaimed Vose Gallery as part of the International Association of Pastel Societies. Celebrating 25 years as an artist, Gregg Rochester’s “Tour d’ Art” (bicycle art show), will tour Europe this summer and be featured in New York and Miami later this year. 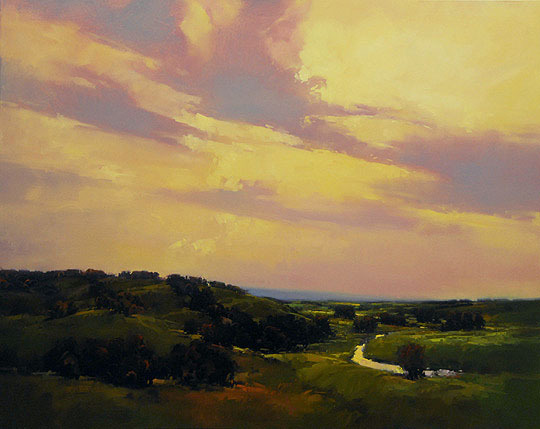 Greg is a well know landscape painter featured on the National Endowments for the Arts website, and named Wisconsin Artist of the year. Ceramics artist Kari Rives was awarded a merit award by juror and international celebrity artist Leopold Foulem. 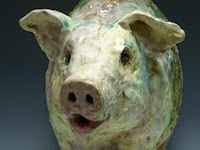 Juror Jim Romberg chose Kari’s work to be included in the Western Colorado Center for the Arts - Ceramics Biennial. Sarah Webber’s “Seated Bunny” was chosen to be part of Art of the Animal Kingdom XIX at the Bennington Center for the Arts.. “Are You My Momma” was juried into the American Women Artists 17th Annual National Competition in Orleans, MA. Wilde Meyer’s talented artist and blogger Judy Feldman had a painting “Friends” included in the Shemer Art Center show, “Animal Other”. Jamie Ellsworth is included in two new books. 100 Artists of the Northwest written by Ashley Rooney, and 1000 Dog Portraits written by Robynne Ray; both include beautiful work by Ellsworth. 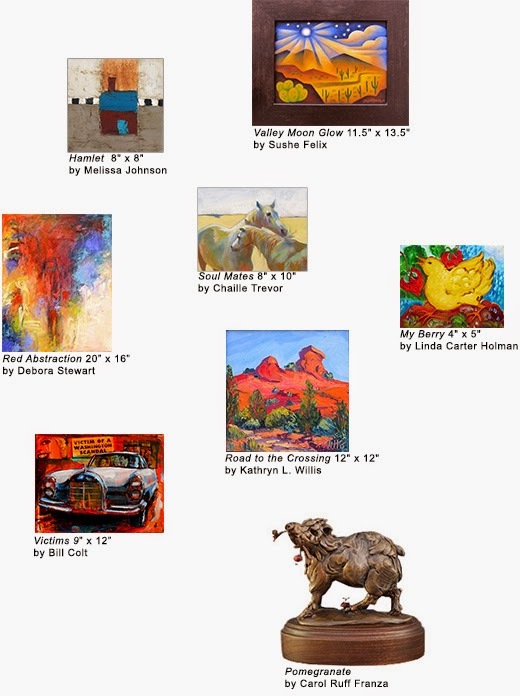 Tracy Miller and Suzanne Betz are both participating in “The Cloud Foundation Annual Art Exhibit”. 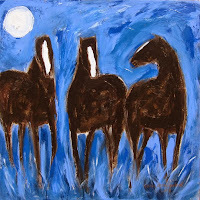 This is a celebration and fundraiser for Wild Horses through Art and Music. This is a really worthwhile cause helping to save our wild horses. Selected as a finalist for this year’s Athena Award, Tracy Miller said it “was a real honor to be nominated. The award is given to outstanding businesswomen in the community, and I believe I was the first artist ever to be in the group”. 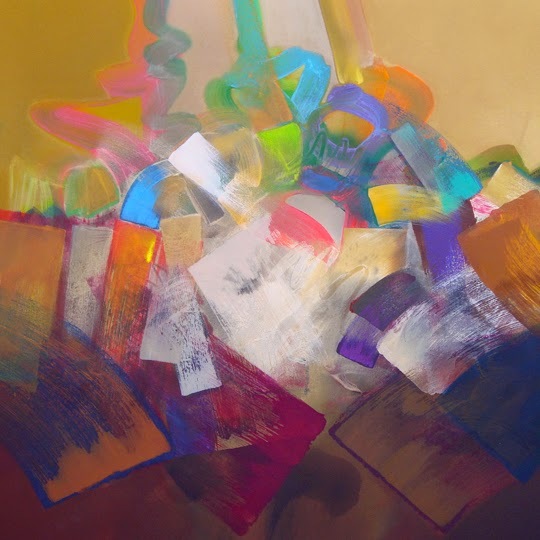 Tracy was also selected out of 1100 artist submissions to be included in the new book Acrylic Works, The Best of Acrylic Painting by Nancy Reyner, published by North Light. 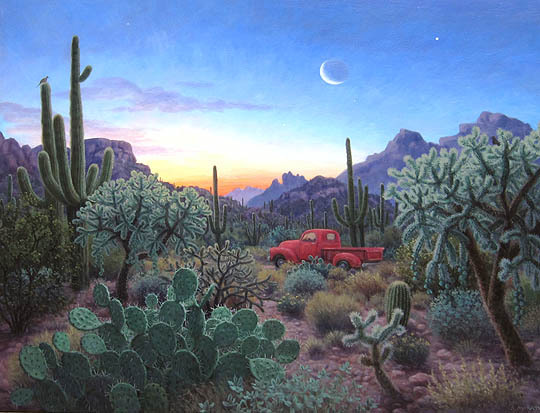 Sushe Felix exemplifies the beauty of the Sonoran desert through her paintings. Over one dozen of Sushe’s paintings were used to illustrate the beautiful program for the 2nd annual Tucson Desert Song Festival. 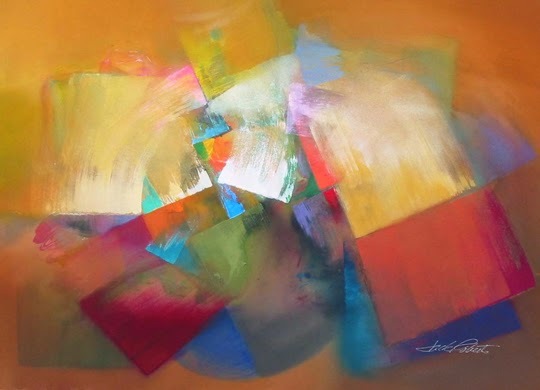 I do not know who originally said this: “Visuals can be Music for the Eye”, but it is appropriate here, for these paintings are truly “Music for the Eye”.